Our own Artem noticed it enabled on his device although he hadn't flipped that switch himself. We traced the change to a commit made at the beginning of the year, and although it should have affected devices on Android 8.0 (since the commit was apparently included in the very first 8.0 release), it wasn't enabled for some of us here at AP until we updated to 8.1. As is all too frequent with Android, YMMV, it's possible that some devices saw the setting change back on 8.0 as well. It's tough to say how much the change may affect battery life, but it's possible in specific circumstances— such as a weak signal—that maintaining a mobile connection while on Wi-Fi could have a negative impact. So if you spend most of your time indoors on Wi-Fi with poor cellular service, you might want to think about changing the setting. 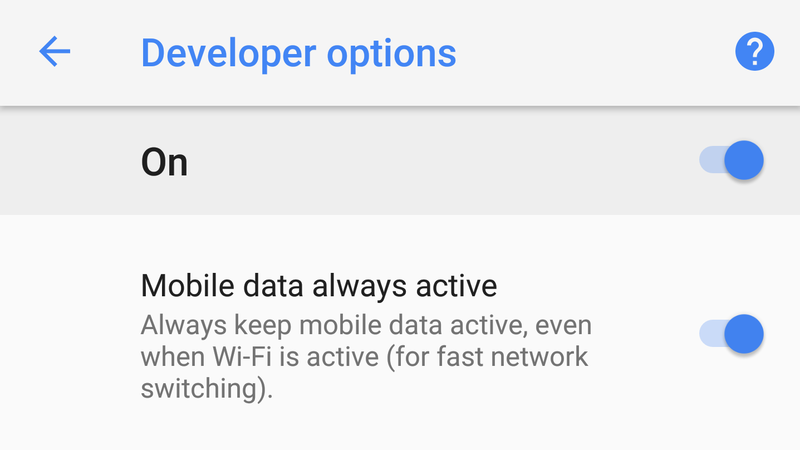 If you'd like to check for yourself or disable the option, you'll need to enable Developer options by going to Settings -> System -> About Phone, and tapping the "Build number" entry repeatedly until it is enabled, at which point the entry will appear in Settings -> System.